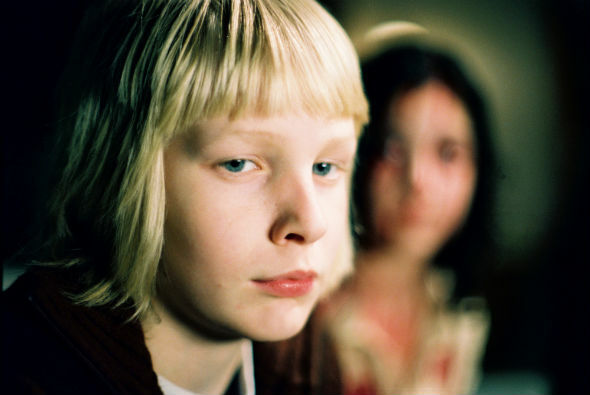 Tomas Alfredson’s “Let the Right One In”, based on the book by John Ajvide Lindqvist who also wrote the fantastic screenplay, follows Swedish boy Oscar, a young misanthrope with an intensely suppressed anger and a penchant for attracting bullies, whose life changes forever upon the arrival of mysterious next-door neighbor Eli, a cute girl his same age. As grisly attacks and murders begin to plague the town, Oscar and Eli strike up a friendship out of mutual, if not fully disclosed, solitude. The two grow closer and soon Oscar is enlightened with the unfortunate truth that things are never as they seem and, upon discovery that Eli is in fact a vampire, is faced with a horrifying dose of life and exposed, for the first time, to the suppositions of evil. Oscar is handled carefully and stricken with an utterly misunderstood vulnerability by Kare Hedebrant, whose pure dedication and inhabitation of Oscar makes his performance endlessly fascinating to follow. Eli, played by the fearless Lina Leandersson, is restrained and kind but laced with a sad wisdom well beyond her years. The direction of Tomas Alfredson must be held in commendation for he extracted performances so sincere and alarming, that the two leads are never held under the microscope or question of validity, their age holding no bounds for the emotional capabilities of their talents. What makes this film work so well is the fluidity of its parts to create a greater and beautiful whole. The fact that the author of the book adapted his work into the screenplay makes this first-hand storytelling that much more rewarding, and under the steady direction of Alfredson, not a single beat or cue is missed or out of place. The cinematography brought the story to life from such a creatively beautiful and torridly cinematic perspective and with the lighting and set design flourishing from hard work and succinct execution, there is not a single aspect of the film that falters or forces one part to pick up the slack of another. Everyone handles the film delicately, as at any moment it could slip from graceful interpretation to unbridled schlock fest. Alfredson and company deliver a film that not only pays tribute to the novel, but also stands on its own as a beautiful work of art. Chloe Moretz in "Let Me In"
The film’s counter point is 2010’s “Let Me In”, which is adapted from the same novel, but this time under the guidance of writer/director Matt Reeves. It is obvious that Reeves was highly influenced by Alfredson’s interpretation, as the set design, lighting and cinematography are high representative of the first film. But while technically exhilarating and fairly successful in execution, “Let Me In” suffers from a fate not determined by its own course, but rather one diminished by the unruly sustainability and influence of the original. We know the story and we know the characters, and while the American version is good, the Swedish version continuously outshines its subsequent remake in every conceivable way. Codi Smitt-McPhee and Chloe Moretz are more than relatable in the lead roles, but they never reach the emotional highs or intrinsic depth of the original leads, a statement that can be attributed to the remake as a whole. Matt Reeves is a talented director and knows how to handle ferocious intensity with smaller, more reserved interactions, creating innately human stories. But the idea of remaking a film so, for lack of a more appropriate term, perfect must not have been an easy one to come by, especially since the both are adapted from the book. And while Reeves does a good job shaking up the narrative and giving the greatly underrated Elias Kostas his due, the story is the same and Reeves’ visual tendencies are not strong enough to compete against the majestic shaping of the original’s palate. It would be interesting to see how the American version would fare to those who have never seen the original, but for anyone who has, the remake does an admirable job but in the end cannot reach the same intrinsic highs as its predecessor.